This day is really a day that is “lucky”, right? Being able to be dine with oppa, from what seemed like a dream, tens of fans gathered on that day, probably having faced a sleepless night in anticipation of it. In an unprecedented event, Yunho and his fans met on the 6th of February, to have a joyous celebration. At 7pm on the 6th, they met Yunho at a restaurant, and hordes of fans both local and international gathered outside; a simple question returns the answer that today is Yunho’s birthday. Each fan came bearing gifts, sincere and heartfelt, staring right at Yunho who was sitting inside. At this moment, they heard Yunho’s voice ring out from the inside. Indeed this is one way to show love to your multitude of fans. 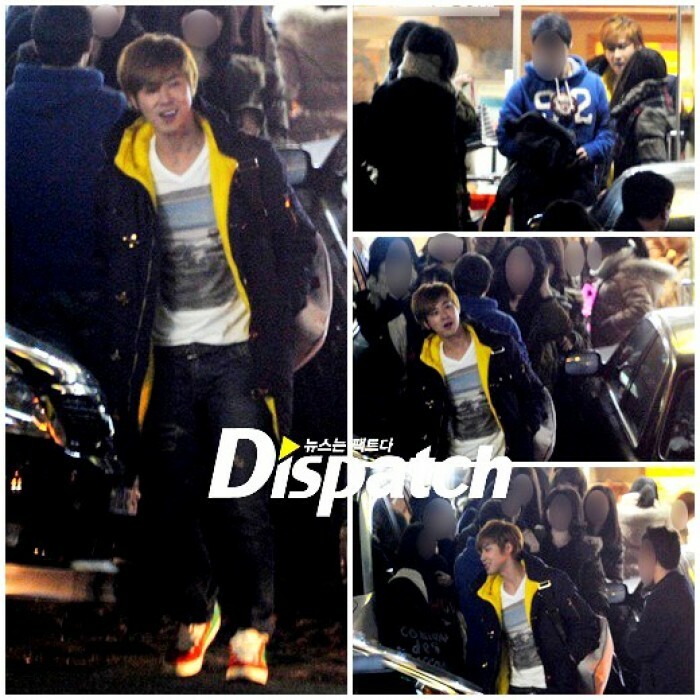 Yunho had seen them wait disparagingly outside, and called them from inside to join them for the meal. Who would have thought that Yunho would take such good care of his fans? Each face showed disbelief, but as Yunho looked on, he was beamed at each one of them. He was far too considerate. Yunho took care of the orders for each of the fans, and while waiting for the food to be served, greeted each fan. When the potato soup reached the table, the fans said in unison “oppa, we will eat well,” before proceeding with their meal. Yunho just kept his pleasant and pleased expression, and watched the fans eat. When all had had their fill, Yunho left the restaurant with the fans, at there was a chorus of “oppa, we’ve eaten till we were full,” “that was extremely delicious,” “happy birthday,” amongst other cries of gratitude. It was just like a fan meeting, and it was truly a memorable birthday. Yunho shyly waved his hand in response, and when receiving the fans’ gifts, thanked each one of them, true to his mannerly idol form, and the fans were just as polite. After a reluctant goodbye, Yunho sat in his own car and left. What style did Yunho have on that day? He was completely un-idol like, wearing a white T-shirt, yellow-lined black coat, and comfortable pants, but he still exuded the same amount of charisma as when he’s on stage, with his newly dyed hair, and he looked put together. Even the usual disguises were gone, such as the idol’s favorite face mask and hat, and he didn’t seem to mind the looks he got from all around. He did not attempt to cove anything up, but talked directly to his fans. This is probably how Yunho has secured the love of his fans even after all of these years. For Yunho and Changmin, as TVXQ, in their activities not just within the country but also around the world, they are international stars who receive the love of fans worldwide, but in front of fans, they are like oppas and friends. We hope that they will continue to build these relationships with their fans. Jin Ji Hui(12), who is debuting in the movie industry with the film ‘Whip’, showed her strong affection for TVXQ’s U-Know Yunho(25), who she appears on SBS TV’s ‘Kim Yuna’s Kiss and Cry’ with. Jin Ji Hui showed off her daring nature as she said, “Age doesn’t matter to me. I call all guys ‘Uncle’ and I call all girls ‘Unnie’,” and “I told myself that I would make an exception to handsome, single men and call them ‘Oppa’, but the only person I’ve made that exception for, till now, is U-Know Yunho.” This means that Choi Daniel(25), who acted as her uncle in ‘High Kick Through the Roof’, falls under the category of ‘Uncle’ as well. There is one more ‘Oppa’ in her life though and he is none other than Yoon Shi Yoon(25), who acted as her older brother in ‘High Kick Through the Roof’. Ironically, U-Know Yunho, Yoon Shi Yoon and Choi Daniel were all born in 1986. Jin Ji Hui began acting at the age of four in 2003 in the KBS daily drama ‘Yellow Handkerchief’ and rose to fame as the greedy and mischievous ‘Haeri’ in the 2009 MBC TV sitcom ‘High Kick Through the Roof’.